Ray Seyer, Wife Lila’s uncle, was going to turn 90 in 2012, so we sat down with him on Oct. 20, 2010, for a wide-ranging discussion about what it was like to grow up in Southeast Missouri when much of it was still swampland. The result was a collection of ten videos that we put together for his family to pass down to their kids. I’ll get around to posting them one of these days. A video that I didn’t include was Uncle Ray talking about one of his first encounters with high schooler Rush Limbaugh. As soon as school would let out, Rush would run home and fire up his CB and monopolize Calling Channel 9, making it impossible for truckers and others in the community to communicate. Despite a career in the Navy during World War II, Uncle Ray contented himself by labeling Rush a “horse’s patootie.” I’m sure he would have been more colorful, had Mother, Lila and Aunt Rose Mary not been in the room. September 9, 2010, when Terry Jones was international news because he was threatening to burn a Koran, I pointed out that Terry and Rush Limbaugh were both members of the Cape Girardeau Central High School Class of 1969. The story didn’t hint that they were in cahoots, it just noted the interesting coincidence that Cape’s two best-known exports were in the same class. The Terry Jones / Rush Limbaugh story was picked up all over the world and got more traffic in three days than I usually get in a month. It also attracted 150 mostly respectful comments. I rode herd to make sure that they STAYED respectful. 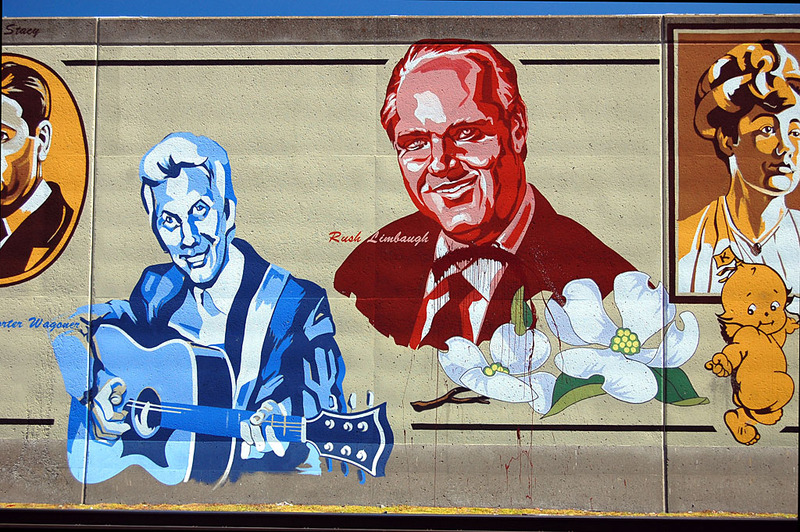 Rush has been immortalized on Cape Girardeau’s Mississippi River floodwall mural displaying pictures of prominent Missourians. I don’t think they’ve reserved a space for Jones. So, you are welcome to comment on an 88-year-old’s recollections of a young Rush Limbaugh, but we’re going to keep it civil, right? Keep it civil? Phooey! That’s no fun, Ken!! You’re affording Rush more respect than he would give you. I heard that the flood wall was recently vandalized. Can we hope that the graffiti was confined to his end of the wall? SHAME ON YOU !!!!! Why is it some people pass judgment on someone who is successful. Brad, the classification of Rush as a “horse’s patootie” was made while he was still “Rusty” in high school, long before he became an economic success (and at a time when there were some who thought he had reached his pinnacle of achievement as a shoeshine boy at a barbershop on Broadway). Rusty was this younger kid who loved to be a clown and entertain around Sunday School. That’s how I remember him. As far as I am concerned, he is still doing that and not to be taken too serious. His most recent comments however, are pretty far out even for him. He should be embarrassed and apoligize. It was the Rush Limbaugh/Terry Jones story that led me to become a fan of this blog. It was my expression of that fandom on facebook that led to a developing respect and friendship on facebook with both Ken and Matthew Steinhoff! Sometimes the Internet is VERY fun and cool. Like this time. Thanks for the insight into Rush. Be well and rock on. My father sold Rusty his first CB radio. The bad part came when Rusy realized he could hold down the button and talk, blocking out all others from the conversation. I guess Rush’s narcissism was hard-wired by then. We used to call guys like that “alligators:” all mouth and no ears. “Horses Patootie” is such a great turn of a pharse and Happy Birthday to your Uncle…90 years is pretty good these days. Rush hasn’t changed much…he’s still a horse’s patootie. Happy birthday to Lila’s Uncle Ray. We need more like him. I don’t know if I’d go that far. Like him or not, he’s one of Cape’s more famous or infamous characters, depending on your viewpoint. On the other hand, there’s a guy who has been campaigning for years to get Chuck Berry on the wall, but he keeps getting turned down. I’m not sure Rush’s infractions are all that much different than Chuck’s. I’m not sure what we should about Rush. He does get carried away sometimes But remember a lot of it is tongue and cheek. He gets paid a lot of money to provoke. I do believe there is at least one other person that should be on the wall in Cape. His name is Kenny Adams. He was born in Springfield but raised in Cape. He is a boxing trainer. He was the coach for the 1988 olympic team, He has coached 18 professional boxing champions 5 at the same time. His gym is in Las Vegas but he still has ties in Cape. He is some Cape can be proud of. Google him and see if you don’t agree. I do believe there is at least one other person that should be on the wall in Cape. His name is Kenny Adams. He was born in Springfield but raised in Cape. He is a boxing trainer. He was the coach for the 1988 olympic team, He has coached 18 professional boxing champions 5 at the same time. His gym is in Las Vegas but he still has ties in Cape. He is someone Cape can be proud of. Google him and see if you don’t agree. Ray is also my wife’s uncle, and I worked with him for years at the Career & Technology Center. He’s a great guy and a most excellent story teller. Happy birthday, Ray! Rush complains about government schools, but HE is a product of government schools, graduating in 1969. (as did I) he went on to become a higher education dropout. Rush is on one side of an issue and those on the other side will understandably be displeased with his view. Rush thought he was being clever and Lila’s Uncle Ray thought Rush was being discourteous. There’s heads and tails, left and right. Which side is best for me? Let me hear the discourse. Convince me. Pet names and colorful descriptive terms can often times help me decide who has the upper hand in the argument. They can also make the telling of your side more enjoyable as is obvious with Uncle Ray. 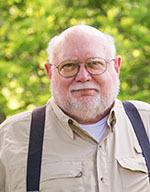 Since Rush graduated Central in the Class of 1969, Uncle Ray’s characterization of him would be based on Rush’s actions as a high school kid, not his politics. Who else can say what they think and get by with it! I like Rush and love to listen to him! That is what he gets paid for! Given some of the above reactions, I can understand how Cape has come to have the highest local taxes in Missouri. It has moved far from the conservative beliefs which Rush once was able to communicate. Thad, so nice to hear you are still alive and kicking! When my husband and I dated back in the late 1940s and early 50s we used to stop in to hear you play the piano and one of the nice little restaurants on Broadway. As soon as we came in the door you used to play “Frim Fram Sauce” for us because we loved it. I thought you might like to know that we just celebrated our 60th wedding anniversary in January of this year. And, you never thought it would last! Unfortunately, Thad is playing his organ and piano with the angels these days. I have a reader who has the annoying practice of posting comments using the names of Cape figures, usually long deceased. I tolerate it because he usually tacks “not” in front of the name and because he generally posts interesting information. I wish he would knock it off. A pseudonym is OK, but it should be consistent and it shouldn’t be the name of a real person. I wonder if we all could have “old” Cape names, Like Howard Took, “Toad” Withers, W. Glen Bishop, Jerry Reynolds, John Crites, “Hinny” Mienser, and “Poppy” Fisher. The idea would be that would would have to write as if we were that person using their ideas and thoughts as applied to today’s issues! So what do you think of this idea? Only if it was clear that was what was happening. I’m talking with the Special Collection folks at SEMO about taking over my stuff when I’m on the dark side of the dirt. One of my proposals is for them to take over the blog, either as a static or live site. I’d hate for anyone doing research to be confused by fake posts. I manage to introduce enough errors on my own. We should count ourselves lucky that Ken does not have access to the milk bucket tapes. I do not agree with Rush Limbaugh on his opinions, but defend his right to say what he says. I noted with some pleasure that several of his sponsors pulled their advertising from his radio show after his last provacative comments, and am pleased that he has issued an apology. I realize that the Tiger Update should not become a political football for our polarized nation, but I am glad for the opportunity to comment on Rush Limbaugh as portrayed on Ken Steinoff’s website. I am embarrassed that Rush Limbaugh is from my hometown, Cape Girardeau. Because someone becomes a millionaire or billionaire with demogoguery day after day is not something to be proud of. Why am I not surprised that he was hogging the CB band when he was a teenager? I was sickened when he made fun of Michael J. Fox’s Parkinson’s disease on his program. I haven’t listened to him much because I’m concerned about my blood pressure. I am so amazed that many women admire him & listen to him. To me they are like the cattle who lick the butcher behind the ear as he leads them off to slaughter! I am proud that my brother, Richard G. Wilson will be remembered for his valor & humanity even when they close the Mail Distribution Center named for him. I wonder how people in Cape Girardeau will remember Rush 50 to 100 years from now? Joanne, I too am embarrassed to share our hometown with Rush. He is a verbal bully and a bigot. I understand that he thinks of himself as an entertainer, but a lot of people don’t understand that fact. How women can defend is beyond me; his so-called apology barely scratches the surface of his incivility. Here’s hoping that losing his advertisers will make him ever so slightly more humble. Keep it civil, right? Rush has always been so civil. I guess that is all I have to say. I realize that the Tiger Update should not become a political football for our polarized nation, but I am glad for the opportunity to comment regarding Rush Limbaugh on Ken Steinoff’s website. I am embarrassed that Rush Limbaugh is from my hometown, Cape Girardeau. Because someone becomes a millionaire or billionaire with demagoguery day after day is not something to be proud of. Why am I not surprised that he was hogging the radio CB band when he was a teenager? I was sickened when he made fun of Michael J. Fox’s Parkinson’s Disease on his program. I haven’t listened to him much because I’m concerned about my blood pressure. I am so amazed that many women admire him & listen to him. To me they are like the cattle who lick the butcher behind the ear as he leads them off to slaughter! I am proud that my brother, Richard G. Wilson, will be remembered for his valor and humanity even when they close the Mail Distribution Center named for him. I wonder how many people in Cape Girardeau remember Rush fifty or one hundred years from now? No problem. 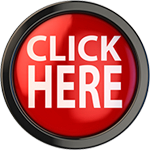 Sometimes you have to press Ctrl-F5 to refresh the content if you’ve been to the page before. On a side note, I was sorry to see the mail facility close in Cape. It seems to me some of the comments about Rush are a reflection of PC. I for one am proud to share my home town with Rush. His willingness to share ideas and opinions came long before his wealth. I don’t always agree with him but I do believe he has the right to speak out and if you don’t agree with you can get your own soap box, instead of attacking him.